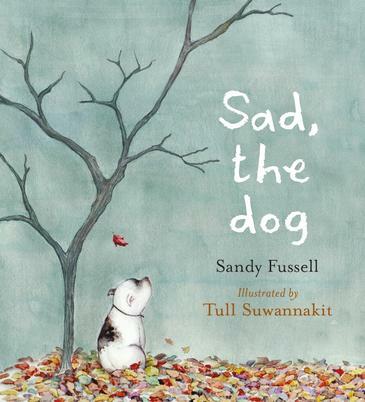 Sad, the Dog is a children’s picture book written by Sandy Fussell, illustrated by Tull Suwannakit, and published by Walker Books Australia (2015.) The Penguin/Random site describes it as “An ode to finding the one who brings out the best in you—and makes you feel as special as you are.” I agree. Explores what it takes to care for a pet. Pets require more than their basic needs met - they need love and attention also. First picture book from acclaimed author, Sandy Fussell. With a poignant depiction of Sad by talented illustrator, Tull Suwannakit - creator of What Happens Next?, that is sure to tug at readers' heartstrings. Provides opportunity to discuss the phenomenon of giving animals/pets for presents, and the plight of the unwanted pet. I have long admired Sandy Fussell’s writing. I loved her Samurai Kids series, Jaguar Warrior, and Polar Boy. Fussell gets the balance exactly right: she’s a gifted and creative writer, who also understands what kids WANT to read. Children might not consciously notice the polished writing, but they surely do appreciate the intriguing plots, the memorable characters, the action and the humour in her books. Sad, the Dog is actually Fussell’s first published picture book. With picture books being such a specialised field, I wondered how this writer of middle-grade fiction would make the transition. She nailed it! Sad, the Dog is a children’s picture book that stays with us long after we’ve read it. It introduces us to a little dog who has owners who feed and wash him. But we don’t see them play with him, and they’ve never bothered to give him a name. Even quite young children understand the power of names and naming. They also know what it’s like to have your creative efforts misinterpreted, and will empathise when the unhappy dog whispers a name in his heart: Sad. Suwannakit’s illustrations are perfect for the story. Sad’s first owners and other characters are shown from the little dog’s perspective, helping us see what he sees. Soft watercolour and pencil images underscore both the gentle sadness, and then the gradual dawning of happiness. Kids will celebrate with both Sad and his new friend, Jack, as the final pages burst with energy and joie de vivre. Sad things happen. They happen to those who don’t deserve them. They happen to children. They happen to pets too. But the wonderful positive message in this book, the thing we all need to remember, is that situations change. Sad, the dog, hits rock bottom the night he is abandoned by his owners. Yet little by little, Sad’s life changes until he learns he can trust again. He gets a friend, a new name, and knows in his heart that he is now: Lucky. A lovely, lovely book, and a great story: Sad, the Dog. This review is part of a blog tour for Sad, the Dog. Check out the other stops on the tour below. Wednesday 7th October: Here at The Book Chook!